The white antique colonial house with black shutters at 1680 Hillside Road was updated from basement to third floor, basically making it a new house. FAIRFIELD — The United States does not resemble the country it was at its founding. Automobiles have replaced horses for transportation. Meals are prepared on high-end ranges rather than an open hearth. Yet what remains in place is the framework for the government that the founding fathers established. The white antique colonial house with black shutters at 1680 Hillside Road in Greenfield Hill probably bears little resemblance to its original structure, which was built in 1914. Yet its framework and great bones provided the underpinnings for its more recent updating; allowing the house to successfully straddle past and present. It was “painstakingly and lovingly restored” from the basement to the third floor with improvements totaling almost $1.5 million. The design was driven by modern function while balancing aesthetics that are in keeping with the age of the home, and the renovation was undertaken by a team of architects and an interior designer, according to the listing agent. “No expense was spared or corner cut to return this grand house to its rightful status as one of the most coveted addresses in town,” the agent said. Its 6,439 square feet includes gracious formal rooms and intimate living spaces. “The wonderful proportions and details harken back to the golden age of architecture in America,” the agent said. Among its many improvements the renovation project included new windows fabricated to match the existing ones, new Marvin windows installed in the breakfast room and sunroom, and new plaster walls to replace the original plaster walls. Walnut floors were installed throughout the main and second floors. The flooring in the formal dining room, front entry and powder room were arranged in a herringbone pattern. A new audio-visual system controls the televisions and music throughout the house. Radiant heat was installed on the floors of all bathrooms. While the house maintains its vintage charm this is really more like a newly constructed home. It has insulation in all the exterior walls where none existed previously when the house was first built. It has a new HVAC system including radiators, boilers and water heaters. It has a new electrical system with new wiring throughout the entire house, new light fixtures and the electrical system was increased to 400 amps. One of the original features that was preserved is found in the formal dining room. A hand-painted mural on all four walls depicts members of the original family and tells the story of their move from England to the New World. Their relocation was not prompted by a tyrannical royal reign unlike those centuries ago who fled England for the American Colonies; whose resulting Declaration of Independence we celebrated this week. 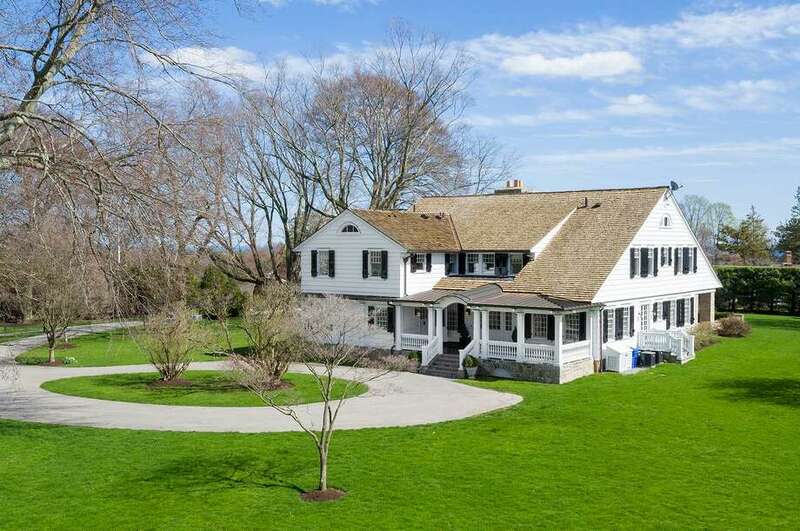 “Uplands,” as this 15-room house and its 4.45 acres are called, has sat majestically at the top of Greenfield Hill for more than a century, although it is not visible from the street. It is positioned well off Hillside Road at the end of long cul-de-sac, where there are two circular driveways in front of the house and a detached six-car garage. Enter the house from the covered front porch. From the sizable foyer there are French doors into the spacious formal living room, which features a marble fireplace and French doors to the bluestone and red brick patio. A portion of the patio is covered and there is a brick sitting wall. The dining room, off the living room, has detailed decorative crown molding. Also accessed from the living room is a sitting room with a fireplace, a wall of floor-to-ceiling built-in bookshelves, and French doors to the patio. Off the dining room is the sunroom, which features stone flooring and French doors to the patio. One should get the sense by now that this is a great house for indoor-outdoor living and entertaining, which is enhanced by the cavernous, new gourmet kitchen. It features a coffered ceiling, center island/breakfast bar topped in walnut, Calacatta Gold marble counters, farm sink, breakfast room, custom cabinets, and a Dutch door that accesses the front porch. A water purifier and chiller are installed by the kitchen sink. Its high-end appliances include a 60-inch Wolf range and warming drawers, and new Sub-Zero appliances including refrigeration drawers. The butler’s pantry sits between the kitchen and dining room and contains a farm sink, wine refrigerator, and glass-front cabinetry. The home office has a built-in desk area, cabinets and draws and special paneling to hide the electrical wires of computers. On the second floor there is a sitting area on the sizable landing. The sizable second floor laundry room has an Asko drying cabinet for delicates and hand-drying items. There are five bedrooms including the master suite, which has a sitting room and a wall of built-in drawers and closets. The third floor was also renovated to provide finished space, including a powder room.